Kaoru　Kashiwagi (柏木　薫) is the captain of the "Goefu", an imperial defendant force of Devanagara. They are the Stage 4 boss on the Brilliant route of Brilliant Pagoda or Haze Castle. They have utmost confidence in their skills, and holds great pride in the Goefu. They speak loudly and flamboyantly, to the point of sounding as if they're acting out a role in a play. 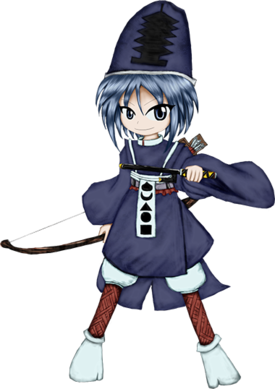 They are quick to anger if they or the Goefu are insulted or mocked, and their leading rank makes them strict to uphold their code. They also seem insistent to take the lead in conversations. Kaoru can spontaneously emit clouds of thick fog, in an array of different colors and chemicals. Their mists can be used passively (covering Devanagara in red fog during a state of emergency) and aggressively (poisoning enemies in battle). Their full name is Kaoru Kashiwagi (柏木　薫). Their first name Kaoru (薫) can literally mean "aroma", "fragrance", "scent" or "smell", and their surname Kashiwagi (柏木) literally means "oak-tree". The name "Kaoru" also has the trait of being a common Japanese name that's also gender-neutral. Their name and concept is also based from The Tale of Genji (源氏物語, Genji Monogatari). The main character's wife has an affair with his nephew, named Kashiwagi. She then birthed a son, and named him Kaoru. It was said that Kaoru always had a pleasant aroma. Kaoru appears as the stage 4 boss of Brilliant Pagoda or Haze Castle on the Brilliant route. Despite them both being in military service, it's implied that Kaoru and Sanra have low opinions of each other. Sanra belittles the Goefu frequently and ultimately sees them as useless, to the dismay and frustration of Kaoru. Although they take issue with their budget being cut, they still serve Mitori loyally. However, this could simply be because they're unable to do anything about it. Kaoru is particularly disliked by Suzumi, to the point where not only did Ardey almost told Hamee to kill Kaoru before they rewind with Trace, but they had to be much more hard towards Hamee to avoid getting Kaoru killed as suggested by the dialogue in the secret team's Brilliant Pagoda scenario. This page was last edited on 20 March 2019, at 10:22.